Keep frozen, Storage store at -18°C or below., Do not re-freeze once defrosted. 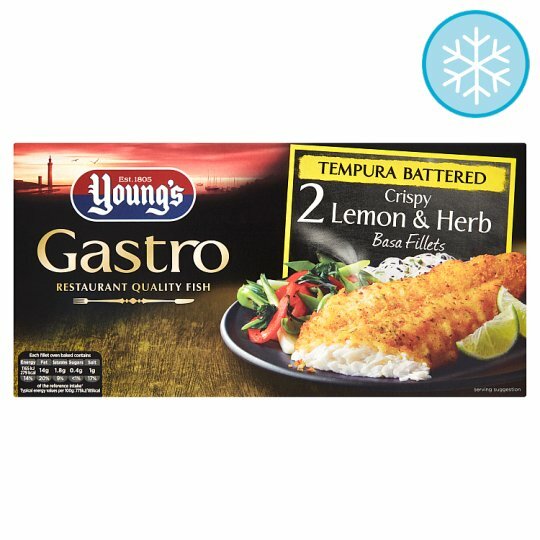 Oven cook (From Frozen): Our Crispy Lemon & Herb Tempura Battered Basa Fillets are best oven baked straight from your freezer. Ensure product is piping hot throughout before serving. All appliances vary, these are guidelines only. 22 - 25 mins to oven bake. Pre-heat the oven and baking tray. Remove all packaging. Place product onto the baking tray in the centre of the oven. Cook for 22 - 25 minutes (fan oven 22 minutes). Try serving these Crispy Lemon & Herb Tempura Battered Basa Fillets with toasted sesame seed rice noodles and crisp stir fried vegetables. Enjoy with a glass of well chilled Bordeaux Rose or an ice cold Japanese beer.